If a disaster were to strike near you, would your community be prepared? How would your SNAP-Ed program respond? 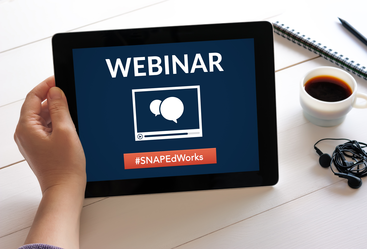 SNAP-Ed Connection is hosting a continuing education webinar: SNAP-Ed and Disasters: Providing an Effective Response. During this 1-hour webinar, we will hear from two SNAP-Ed agency program leaders who have experienced disasters first-hand, and successfully met the needs of their community. We'll also hear from a food safety expert who will share how you can prepare in advance for possible emergencies. Disasters are usually unexpected, so you never know when the lessons learned from this important webinar will come in handy. The webinar is free but registration is required. Reserve your spot today! This continuing education event is pending prior approval for 1CEU hour from the Commission for Dietetic Registration. SNAP-Ed Connection is funded by the United States Department of Agriculture (USDA) Food and Nutrition Service (FNS) and is a resource for SNAP-Ed personnel. Copyright © SNAP-Ed Connection, Food and Nutrition Service, USDA. All rights reserved. You are receiving this email because you are affiliated with a State or Implementing SNAP-Ed Agency or you opted in through an email, through the SNAP-Ed Talk listserv, on our Web site, or at a conference.